Unfortunately, RealtyShares is no longer accepting new investors on their platform. I suggest taking a look at Fundrise, the pioneer in eREITs and a platform for non-accredited investors. They are also currently working on an Opportunity Fund to take advantage of tax-efficient Opportunity Zones. Fundrise was founded in 2012 and is open to all investors – accredited and non-accredited alike. 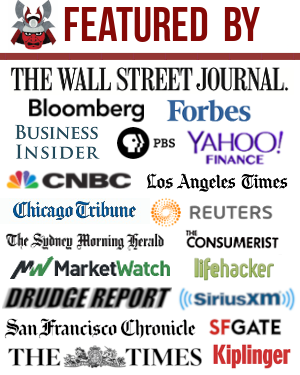 If you are an accredited investor, take a look at RealtyMogul. They operate at a smaller scale, but have more stringent underwriting in my opinion. They were founded in 2012 and are focused on long-term profitability. I expect them to buy RealtyShares’ assets and provide a seamless transition for platform investors like myself. Please check out my Real Estate Crowdfunding Learning Center for more information about this fast growing space. 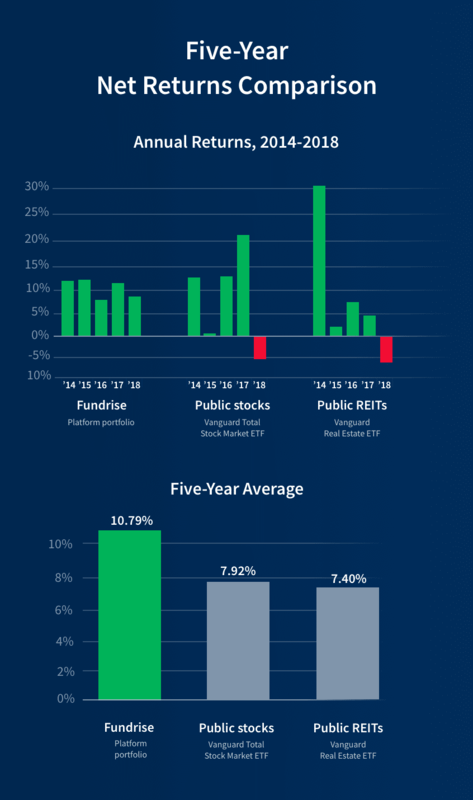 In 2018, Fundrise returned 9.11% net of fees, a significant 14% outperformance over the Vanguard Total Stock Market ETF, and a 15% outperformance versus the Vanguard Real Estate ETF. Fundrise also outperformed the S&P 500 index in 2018, which was down 6.4%. All-in, Fundrise had a banner year, and they’ve once again shown the power of their platform as they carefully vet only the best deals with rigorous underwriting standards for investors to consider. Take a look at their 5-year net returns comparison below. I am continuously impressed with Fundrise’s forward-thinking ways. My only wish is that they open up a satellite office in San Francisco so we can go get a beer and brainstorm about the future of real estate even further. Sign up with Fundrise here today. It’s free to explore. Woah really surprised to see RealtyShares suddenly shut down like this. I learned about them (and RE crowd investing) recently and invested in a couple deals. Seeing a lot of reviews and financial blogs mentioning them definitely made me think they were one of the more stable ones. Did anyone else get the RS email that they did not get new funding and will not have any new investments or new investors?? Yes, so sad and surprising. Here are my thoughts posted in the forums on RealtyShares closing its doors to new investors. Sam, I just got an email that RealtyShares won’t continue offering new investment. That’s too bad, I really like their platform. What other RE crowdfunding company do you recommend (that you might also transition to)? My two favorites have always been RS and Fundrise. Fundrise is open to non-accredited investors and they’ve always been the pioneer since they started in 2012, with eREITs, and Opportunity Fund, and an Internet Public Offering. Having a fund is a much better way to do business, and it’s probably better for must investors as it’s harder to pick individual projects. Hence, why I invested in the RS DME fund. Hi there, do you know if Realty Shares is now taking 1031 exchanges? If I have a large gain from a property owned many years, I am interested in investments to defer the gain. Do you feel that investing in this type of platform has more advantages than investing in publically traded REITs with high dividends? realtyshares over realtymogul any preference why? RealtyShares has a bigger platform, more company funding, and I’ve met at least 8 people at RS so far. I invest in people, and since I haven’t met folks from RM, it’s hard for me to make a decision with them. Check out GlassDoor as well for inside scoops on what it’s like to be at both companies. The last few times that I’ve looked at RealtyShares, the site has stated that there were no open investments. Also, two of my investments were returned much earlier than the projected time frame, as permitted by the terms of the agreement. Have you checked in with RS lately to see what, if anything, might be going on? I know they did a complete rebranding in August 2018. I see available opportunities right now. Guess the opportunities are cyclical. Interesting! My view still says “no open investments” at the top and each of the individual entries either states “temporarily unavailable” or “sold out”. I guess RS doesn’t want any more of my money. we’ll have at least two go online next week and are expecting ~35MM of deals over next month including a very prominent hotel development deal in Manhattan. It looks like temporarily, there is much stronger demand to invest in real estate crowdfunding been supply. So we’ve got to be diligent to stay on top of the deals. I received the same notice along with the requirement for thrird party verification of accredited investor status to participate. Hi – relatively new to your site. Very well done. Quick question about using these real estate crowdfunding sites (which I am now considering). Part of my overall plan is to leave a decent inheritance to my two kids (and hopefully some grandkids). I have purchased three investment properties as part of my overall plan. As I see it, part of the benefit is that I can depreciate the properties over the course of my lifetime gaining the related tax benefit, and then leave the properties to my kids with a stepped up tax basis so they pay no taxes. Basically I get a ton of fax free income and my kids don’t have to pay for it later. Would that be possible using the investment opportunities on Realty shares or similar sites? Thoughts in general? Thanks. Would love to get some updates on your investments with RS. I recently did a minimum investment to “test” out the platform. I did do some research on reviews from previous investors of RS investments and they were mostly negative, e.g. investments defaulting. So far, so good. I’ve invested a total of $810,000 with RealtyShares after I sold a rental house in 2017. I’m pleasantly surprised on the upside with the investments, interface, and results. I created the Real Estate Crowdfunding Learning Center for more info. Thanks for the straightforward updates. We have hesitated investing because I thought our Real Estate LLC did not qualify (<$5M in net), but in fact, it does qualify because my wife and I are both accredited investors and the only owners of the company. Going to kick off this investment diversification very very soon. Thanks again FS! Go Bears from Houston!! The home prices went up quite a bit since I moved here over 10 years ago because of oil & gas. it was weird because such increases pretty much always happened at the coastal cities. However, i still think prices will cobtinue to increase due to shale oil and gas and migration from expensive cities. I dont think you guys talked about the legal and financial risks about these crowdfunding investments. what happens if there is a fraud and any of these companies go bankrupt?? what percent of our investments we can lose? also, how are the risks and returns compared to the reits traded in the stock market?? I am an accredited investor, but did not invest in crowdfunding yet. Just thought I’d weigh in and share my 2 cents since you are looking at investing. I’m from Alabama, Huntsville specifically. But I have a lot of friends from college who now live in Birmingham. The city is growing, not quite as rapidly as Huntsville as I understand it, but it is still the biggest city in Alabama. Birmingham has exploded recently due to the huge growth in medical centers in and around the city. The friends I have in Birmingham pay a premium for rent compared to the rest of the state. I have heard stories of crappy houses selling for insane prices. Idk if that is indicative of a real estate bubble, but I would venture that because of the high volume of young professionals moving to the area (this is even more true for Huntsville) that an investment in apartments or town home style housing would be a safe(r) bet. Hope this is helpful. I love the site! I am just starting out and looking to invest in my post tax income in the market as my capital is still low and I don’t understand real estate well enough to venture into crowd-sourced realty just yet. Best of luck and keep up the excellent work my friend! Thanks for sharing this information! In the media, we only hear about the crazy markets in San Francisco, LA, Seattle, Portland, Denver, and New York City. But I do believe everything is relative, and there is a lot of opportunity in the heartland as well, where I am focused for the next 5 to 10 years. Take your time exploring the side and learning about different things. Hey Sam! How is does RealtyShares differ from Fundrise? Would you recommend it also? I’ve been reading your blog on and off for the last 3 years, and this is my first time commenting. I really appreciate how you lay it all out there, especially with your reasoning. I have a question – did you do a 1031 exchange on the SF property you sold into Realty Shares? The reason I’m asking is because I have a rental property that I’m tired of managing, and would like to sell, but it’s appreciated a bit (it’s in Washington, D.C.). I’d like to avoid paying the tax on that appreciation for now, can I roll the proceeds into Realty Shares without paying capital gains or recapture taxes? Thanks so much for your blog, you do a great job educating us! I asked RealtyShares if they had a 1031 exchange property, and they only had one, in Houston. But the deal wasn’t big enough b/c for me to qualify, I needed to invest $2.74M in exposure, and the deal size was $5M. I didn’t want to be over 50% of the deal. I’ll publish a post on 1031 Exchange, and why you might not want to do it this November 2017. Stay tuned. A few comments with RS. I have been with them for approx 16 months. Things went great at first but now at the point of 5 out of 14 debt deals in foreclosure or another issue. The “only 5%” of deals make it thru funnel leaves me wondering. My equity deals so far have been performing as promised. Not sure how the DME fund is doing, but any feedback on it would be appreciated. Maybe that is the better approach. Also — for real estate debt deals i have started looking at alphaflow.com. The have a single fund and spreads that out over 70+ P2P real estate platforms. Rob, do you mind telling which debt deals are going bad for you? RSL.201608.11 Nationwide SFR Package – Defaulted. May take year to settle. Update. The RSL.2016B.86 350 Galina Lane Tranche 2 made payments so is back to current. The others are still as described. It would be nice if RS actually published good AND bad loans so we could all see track record. Sam, I am curious on how your investments are doing on Realtyshares? Do you see any defaults / foreclosures? I have invested in a deal so far I am all have been good. But I’m investing in equity deal so they take a long time to play out. I just got a $2500 distribution today actually. Sam, regarding RealtyShares and investing via Simple IRA, do you have any recommendations on custodians that can hold the IRA without gouging high fees, etc.? I have a RealtyShares account but want to invest via one of my IRA’s, but the IRA must be transferred to a custodian like Entrust or Millenium that will allow for those types of investments. I too am in Northern CA and want to diverse holdings to other areas of the country as well. RealtyShares seems like a great investment vehicle to serve that purpose! Do you have any updates on your RealtyShares experience? Online reviews seem to be all over the place, and I’m interested to hear your (more trusted) experience. So far, so good. I invested in one project in PA for $10,000 and I decided to invest $250,000 in the Realtyshares DME Fund in Feb 2017 that chooses the best from its platform. They have a pref return of 8% and a target IRR of 15%. I figure, might as well have the gatekeepers of the deals choose what they think are the best deals right? The only problem is that the minimum is $250,000, so I haven’t talked about it. I’m not sure if anyone has addressed this, but does the company have a contingency plan in place should they burn through all their cash and close their doors? Is there a plan in place to wind down the investments should that happen? I couldn’t find anything on their website or in the comments addressing this. There are a lot of companies entering as well as burning out of the P2P space right now. Excellent question, and something I asked one of their capital markets people. The capital you deploy will continue to be invested in your particular investments, and First Associates main roll is to handle the distribution and collection of payments. Good to see they have a plan in place. Additionally, I’d imagine a reduced risk of fraud in real estate p2p versus lending club/prosper. I’ve been using Realtyshares for about 2-3 years now. Been in about 5 offerings my self. 2 of the debt deals have already paid back interest and capital since they were the shortest, ranging about 9 to 12 months. The other three are are preferred equity deals which are still in progress. Overall I am happy with the service and platform. They are very responsive over email and will gladly answer any questions that pertain to any deal on the platform. It started off as an experiment but I am now getting more comfortable with crowdfunding and will slowly allocate more of my asset allocation to this asset class. I have also allocated $5500 to the fundrise growth eREIT. I have allocated pretty much the minimums to all these deals. I’d advise start off slow and stick to the minimums, do research, and over time one should get comfortable with how to compare deals. 4) Parents really don’t want to move. I have/had dreams like you of buying a place in Hawaii with a nice ohana quarters. The vision is to live that dream life of waking to the smell of plumerias, coffee in hand as I stare into the vast Pacific Ocean, while figuring out which brunch spot to hit before hitting the beach. Part of this vision is that the parents would stay in the quaint ohana quarters so that we have our perfect family compound in paradise. The kid would be going to Punahou, of course. The wife would be working the necessary social network to ensure some position within the community. I would be a 2-index at the golf club and thus feared and admired for my grace, talent and impeccable flop shot with the 60 degree wedge. It’s funny though, that the parents, who have lived for decades in a seemingly dreary existence in a middling house in a middling neighborhood with middling friends are apprised of this paradise vision of life that can be had…and yet the parents refuse the offer before the pitch is even midway. The reality is that your parents, my parents, other parents…they are all human beings who have built a life that literally has immovable roots connected to that middling house in the middling neighborhood surrounded by middling friends…and that’s their own version of paradise. Move them to that high falootin house in Kahala and they will lose a comfortable house, a neighborhood they are familiar with, and knucklehead friends who have grown old together with them. The ocean view wouldn’t be the same for them. You’re pretty spot on. We get set in our ways the older we get. I don’t mind saving my money and just do some remodeling instead if necessary. But that also looks unnecessary. Simple is nice! I’d be curious to read a post about how RealtyShares compares to Fundrise since you have dabbled in both. Howard: RS has a partnership with Entrust Group and currently charge a flat fee for the RS portion of your SDIRA. I am currently using Equity Trust and will be moving my $55K RS investments over at the end of the year when my annual fee is up. As always this is very good post with right timing on investing in Realty shares. I registered few days back and just made my first investment for 5k in Debt. I am curious on what kind of strategy you are going to apply here as you just have 10K to invest? I am still deciding on how much should i put in here. Next market crash is really scaring me but i think we still have 1-3yrs :(. do you have a recommendation for a custodial service to set up a self directed IRA account to purchase real estate investments from Realty Shares? I have used Fundrise since 4/15 and have been very happy. They now seemed to be solely focused on EREITS which doesn’t allow for the time diversification I am looking for. Thanks for the info on Realty Shares. Cool, it looks like you can invest directly in equity and just be a [small] part owner of a property, right? Putting aside your personal connection to RealtyShares, Sam, which platform would you recommend: RealtyShares or Fundrise? Or would you recommend both like in P2P lending (they say to invest in both Prosper and Lending Club)? Quick question: You don’t have to be an accredited investor to invest, right? My thought process is should I just keep putting money into Index funds (FSTVX- Taxable account) that have been getting 4-5% yr and not throwing off much taxable events (until i sell) or do I do a Crowdfund for lets say 9-10% but need to pay taxes at end of year (28% tax bracket). With my tax bracket, my 9-10% return on this would be closer to 6-7%? Right? Do you know if there are state rules about being able to invest in Real Estate Crowdfunding? I wish my friends had this mentality. Most of them jump into bidding wars without thinking. Most of them have never even heard of Price-to-Rent ratio or Cap Rate. *shakes head* This is why the Toronto and Vancouver housing markets are doomed. Real-estate crowd sourcing sounds interesting. We have REITs in our portfolio, that’s the extent of our exposure to real-estate. So far it’s gone up 20% in the past year–higher than the 16% rise in Toronto housing. What are your thoughts on REITs? I like all income producing assets, including REITs. This low interest rate environment necessitates them. You mentioned that you opted not to buy in Hawaii, in part, because you didn’t want to pay very much more in property taxes or deal with tenancy issues. Yes, the returns should be reflected in a RS investment. The fees, taxes, maintenance etc should all be baked into the returns. If I can get 9% – 12% net after everything without doing anything, that’s really all I care about. In and out over max 3 years. Not perpetual taxes and maintenance. This is the way I understood it. I registered for an account and reading more about it but also trying to figure out the tax consequences. If I remember correctly I read that investing in different states may require filing a tax return in that state (I was getting tired). Then there is the choice between debt and equity considerations. It says there is a 30 day cooling down period which I think is a good thing but after registering there was a message that said that I would get a call that may allow them to reduce the 30 day cooling down period. I wonder how that works. $50k in property taxes?! dang that’s alot! Homes seem to have a greater sentimental or emotional value for you, It seems you are very reluctant to sell and take the gains. Maybe the market is different in SF, here in Vancouver it feels like an impending bubble. If I were in your shoes I’d sell all the properties, put your portfolio or “nut” in bonds/dividend stocks and live off the yield. With your net worth you probably would get over $100-200k cash annually and factor in low dividend taxes, no property taxes or maintenance you could rent your own dream place in HI. forget about buying! I’m impressed with the 15% Foreigners Tax implemented in Vancouver! Surely that must pop the bubble as everything pauses and causes sellers to get desperate, no? Maybe the foreign money actually makes its way to places like SF as a result. I’ve wondered for a long time what type of industries and jobs make Vancouver RE so expensive. Could it really just be money from China, accounting for 5% of volume? I wanted to sell my 2/2 condo when my tenants vacated, but didn’t go all-out in marketing it (didn’t put on MLS, or do any light remodeling). So maybe I didn’t really want to sell. But I did find tenants who are paying $200/more a month (5%) who seem ideal. So we shall see. Yes, $50K/year in property taxes is a crap load of money. So it’s vexing when someone who pays $0 property taxes a year votes to raise property taxes further to fund our community. We really should institute a Residence Tax where EVERYBODY pitches in, and therefore thinks twice about voting for ever more spending. hey Sam, the tax was just implemented so we’ll see what kind of effect it will have. Prices have risen drastically in the last 15 years. I could have bought a brand new condo in downtown then for $100-125k, now prices start at $400k. And salaries obviously haven’t increased at the same ratio. There really is no industry or jobs that justify prices. It makes absolutely no sense except that it’s a bubble mentality. What is the advantage over directly buying notes? And if the developer has overpaid; does Realty Shares have any servicers? Looks interesting – will have to look into the details closer. What I’m most curious about is what happens when things start to unravel. We’re at record price levels again, and most of these investments are several years out. While I tend to agree low rates are going to be here for a while – IMHO, there’s going to be a *pop* at some point and it could be a really nasty one again. Same concern with the LendingClubs of the world – everything looks good in hockey stick chart periods, but what happens when the party stops. There’s simply no data points to go by; simply too new. Short term investments in RE over the next few years at least initially feels like musical chairs – hope you get your money before the music stops. Whereas a traditional rental property, the music stops and you can just hold and ride it out. RealtyShare website has 3 options for their drop down “How would your $10K have faired” – and 2 of the 3 show you were better off investing in the S&P 500. I get the diversification approach here, just thought it was interesting to see that. Unprecedented times, with massive amounts of money chasing yield. True, I wonder when a nationwide RE slowdown will occur. I KNOW it is occurring in NYC, SF, and Honolulu b/c I follow the markets closely. I do not plan to reinvest in these markets for at minimum 1.5 years from now, but most likely 2-4 years if ever. Instead of throwing $3M into Honolulu w/ leverage, where I think I can get a deal, I’d rather invest $50,000 – $300,000 cash in higher cap rate areas and projects. I’m chasing yield for sure. Just trying to be more disciplined about it. What are your investments and what are you doing w/ your money? I’m further South in CA. Housing down here has gotten crazy again IMHO. A couple of my friends are actually looking to sell now to lock in a couple hundred grand in profits, then rent and ride it out expecting a downswing in the next few years. The number of $90,000 Tesla’s I see on the road seems to be increasing at a dramatic pace. Market at records highs. Rates at unprecedented lows. Having been through the last two big bubbles, there’s a lot of similarities. LendingClub stock is now at $4, and another report just came out showing investments into online lending platforms is down 44% first half of this year vs back half of last over concerns of fraud/risks/etc. If companies like this are already getting thrown back against the ropes in the second largest bull market in US history… what happens when the music changes tunes or stops? That’s my biggest concern on these new social lending sites (of all varieties). Seems like exponentially more risk, for about the same return as a wildly diversified Vanguard fund. I’m an active investor in many deals on RealtyShares, and have been doing it for more than a year. (Also active on PeerStreet, which is mostly first-position notes) Everything has been great on RealtyShares so far, and I’m now in process of setting up a SD IRA to do even more. I’ve researched just about all the crowdsourced real estate and other alternative investment platforms (more time than I care to admit) and I highly recommend RealtyShares. I’m primarily doing preferred equity deals, as the time horizon (2-3 years) fits with what I want. Returns are in the 13-15% range. For crowdfunding deals like this, I personally think preferred equity (or hard money loans) make more sense than JV Equity — the due diligence I’d have to do to feel comfortable with the downside risk of returns on JV deals goes beyond the scope of information shared on crowdfunding sites. Preferred Equity (investor gets X%, principal takes the rest) seems to fit the crowdfunding model better, where there is less connection and therefore less trust and less info sharing between the LPs and the GPs. I do JV Equity deals, but with investors I know, not on crowdfunding sites. Setting up an SD IRA and putting a heavy allocation into RealtyShares deals seems to be the winning ticket for retirement savings, even if there happen to be some busted deals along the way. That’s what I’ll be doing, and I’ll end up with about 10X the money vs. the crappy traditional mutual fund route when I start withdrawing in 25 years while sitting on a beach! Hah! At first, I wrote your comment off because I thought there would be more than enough investment choices to choose from. But as I do more research on the investment opportunities, many are unavailable or I’ve got to get on the waitlist! Since I’m focused on the Midwest and South, perhaps only about 30% of the listings are available to me. Hence, I’m learning I need to be patient. I definitely want to do a Self-Directed IRA for these types of investments. Hopefully the tax docs will be much simpler as a result. If not, I can just file the K-1s. I need to double check w/ RS and my custodian bank on SD IRAs. I’m waiting on them to get back to me. I’m also going to focus on Pref Equity. No JV deals for me. As an experienced RealtyShares investors, I’d love for your to share in a guest post how you go about picking your investments, your process, your reasons, and your returns one day! Indeed, you’ll need to be patient if you (very intelligently) have specific criteria you’re looking for. RealtyShares seems to have one of the highest # of active deals of any of the crowdfunding sites, and at least for me, I still only see a deal I want to invest in once every few weeks or so. And often time those deals will “sell out” within a day or two, so you have to stay on top of it if you’re serious about it. I expect that will change as they continue to build up their deal flow. There seems to be a lot of good things happening to make it easier to invest SD IRA funds in crowdfunding sites. Within the last month or so, RealtyShares has made it easier to invest from a SD IRA, or at least they have advertised so. On the SD IRA custodian side, I’ve noticed a couple of them have setup specific “plans” for people investing in crowdfunding sites — these “plans” have significantly lower fees for crowdfunding deals compared to other SD IRA investments, so you end up paying significantly less to put $50K in a crowdfunding platform vs. $50K in a direct real estate deal or $50K in gold, for example. Still not as easy as just opening up a Vanguard account for a rollover IRA, but I expect this SD IRA + crowdfunding real estate strategy to pick up a lot of steam soon. Guest post about my RealtyShares experience? Sure, I’d be honored. My first deal on the platform finishes its term in 11 months…. Personally, at least, that is an interesting date, as I’ll have had experienced how the platform works throughout the entire deal cycle. At the very least, I’ll update you with the status here in the comments. Ahem… self accredit? Does this mean RealtyShares will not be inquiring whether I have $1M in investible assets or maybe just $600k and a larger than average risk appetite? I’m not sure, but I’ve never been asked to verify my assets or income in the multiple private investments I’ve made since around age 26. The rule is to protect both the issuer and the investor. The issuer doesn’t want to have backlash against the person who couldn’t afford to lose money in case of a bad investment. The gov’t is also trying to protect the investor from not doing a proper investment allocation. But now, when investment limits are so low e.g. $5,000 versus $250,000 or $1,000,000 previously, the rule makes less sense now. See: Can Anyone Be An Accredited Investor? Thanks Sam, this looks very interesting and will take a detailed look into it. O the capabilities of the modern internet era! Thanks for the overview, Sam. I’ve been watching this “real estate crowdfunding” movement for some time now and have wondered whether there’s anything more to this movement than a millennial-styled rebranding of REITs, plus a couple of troubling operational differences. The lack of liquidity and higher leveraging of investments via crowdfunding platforms relative to REITs makes them much riskier, yet their incrementally higher promised returns and incrementally lower implied correlations with other asset classes don’t seem to compensate for the added downsides. Compared with traditional, straight-up physical real estate investment, RealtyShares, et al. are almost certainly better. Compared with REITs or REIT ETFs? Hmmm… Hard to see how they’re any better, if not worse. Any thoughts on this front? I think one can and should consider both. REIT ETFs have done great, and will probably continue to outperform as investors search for yield. For a real estate crowdsourcing investment, it’s about finding the right property. So, you are making a more concentrated bet on specific regions and properties versus a REIT which has a larger portfolio. Just more surgical. Everything is relative w/ liquidity. I locked up $250,000 for 7-years with this CD coming due. For folks who have extra savings or aggressively spend less than they make, they WANT to lock money up for as long as possible and just collect income. It’s when the money comes due when there’s actually a reinvestment problem b/c I don’t plan to spend any of the money. Going from a 7-year CD to a 6M – 3Y investment is more liquidity. I’d prefer 5 – 10Y lockups with a high IRR actually. Any particular REITs you are looking at? Thanks for the reply, Sam. Your thoughts make sense. I agree with you entirely on the hunt for yield in this environment, especially with a Fed that seems stuck in limbo. I think we have somewhat different views on the role and value of liquidity in the portfolio. Your older CDs are (very) valuable because they locked in relatively high yields in an environment of declining interest rates. And, as you say, for long-term investments with no plans to touch principal, liquidity doesn’t seem to matter much. On the other hand, restricted vehicles like CDs make rebalancing a bit tougher and foreclose (or complicate) opportunities to change strategy in the face of an altered investing environment. Betting on the direction/duration of interest rate action is close to gambling. And anything with a 5-10 year lock-in at fixed rates could go either way for the investor relative to the RFR or inflation. Having said all that, your view is sensible, and the difference in our perspectives probably boils down to little more than delay discounting preferences. Particular REITs? I’m not one for making stock picks. One REIT I’ll mention, though, because it seems to satisfy two criteria important for REITs (appreciation/income and low-ish correlation with the S&P) is RWR. It’s performed well over the last several years, though it’s hardly “particular” since it’s a broad-based ETF. “Surgical” it isn’t; but that’s kind of the point of these ETFs. By the way, if you’re looking for a solid IRR in an “alternative” investment with zero correlation with any other asset class, I encourage you to look at the arbitrage opportunity surrounding Dieselgate. If you’re interested, here’s an overview of how to turn a nice profit and get a free car in the process. What are your thoughts on RealtyMogul’s recently launched non-traded REIT They’ve made it available to non-accredited investors with a minimum investment of $2500. They’ve acquired two properties so far and both seem reasonable. Might be another option for real estate diversification without the high commissions/fees of traditional non-traded REITs or market correlation of publicly traded REITs. Another amazing article and can’t wait for your results to come out! I currently testing out with GroundFloor. About month into the process, It looks pretty good so far. I assume RealtyShares probably only for accredited investors. My questions will be how will your tax be taxed? Isn’t the tax so much better and lower when you directly own properties? Also, you can find more information on our website under “learn” and “blog”. What a cool alternative! No stress and you get to save a heck of a lot. Managing tenants and a mortgage can be super stressful so this is a convenient way to get exposure to real estate without all the hassles of real property. Can’t wait to hear about how your investment goes! Looks like a pretty good opportunity. I’ve been hearing a lot about these crowdfunded real estate companies. It will be interesting to see if one becomes dominant. I’m bummed you have to be an accredited investor to participate. With minimum investments of $5000, it’s easily within reach of non-accredited investors. It almost feels like a way for the rich to get richer while keeping “poor” people down. I hear you. There are even investments below $5,000 as well. Check out these two posts on accredited investors, fairness, and policing. I like your proposed definition for an accredited investor. This seems like a great opportunity for people who don’t want to deal with tenants, maintenance, put a whole lot of cash down on a property, etc. I have a medium to long term (3-5 year) plan of acquiring a real estate investment property, but now I’m wondering if I should earmark funds for something like this. Are there more reviews/independent feedback on RealtyShares ? Also, how does RealtyShares compare to Fundrise, which will accommodate to non-accredited investors, like myself :-). I’ve been thinking about real estate crowdfunding too. I like it better than P2P lending now. P2P lending isn’t bad, but I’m sure the return will turn negative as soon as we get a recession. I guess we’d see the same with real estate, but at least you’d have some collateral. I need to do more research too. I think Realty Shares and Realty Mogul are two of the better ones. I am glad that even people who’ve achieved FI begin new investments in smaller increments to test them and see how they feel. I’m not a qualified investor, but I will be interested to see how this works for you over the next few years. This sounds similar to your post about EQ vs IQ. Again you probably like the idea of using a service that was not only formed right in your hometown, but you also have a relationship with one of their executives. Thanks for providing an honest feedback on the service. I also look forward to hearing more about what you invested in. Thanks! Yes, there are several real estate crowdsourcing platforms to choose from. They all have some good things going for them. I chose RS b/c of their offer and my prior relationship with the VP of Finance. When I was in the office, we’d joke around all the time. He’s also a Cal Berkeley MBA grad, so that helps too. SF-based, Cal grad, prior-relationship, able to sit down with them for two hours face to face, able to continue meeting them in person, and solid electronic communication outreach all played a big role. All these options for real-estate crowdfunding really make me looking forward to becoming an accredited investor! I don’t know about Texas in general, but real-estate in Houston has many good opportunities for rental properties. The market appreciates slowly (2-3%/year in my area) but the rents are relatively high compared to the acquisition cost. I actually bought a house because the monthly cost (taxes, mortgage, HOA, …all included) is lower than my previous rent. I disagree that Houston real estate represents a good investment opportunity. The housing market is still inflated from the oil boom of 2008-2014. Prices have fallen somewhat from their peak, but there are a few factors that suggest the bottom isn’t close. First, there is a lag with the oil company layoffs, where people are still able to make ends meet for a while. Despite massive layoffs, we haven’t seen a significant increase in foreclosures, but its coming. Second, people are still stuck on ideas of what their home is worth based on the 2014 peak. They are reluctant to sell for less, so homes are sitting on the market and inventory is building. Lastly, despite the common assertion that Houston has diversified its economy, oil and gas still drives roughly 80% of the Houston economy. Most non-oil jobs just recirculate money brought in by oil and gas. Recently, we’ve hit a tipping point, where not only is the oil and gas sector losing jobs, but non-oil and gas companies are shedding jobs because the oil money that sustains them is evaporating. Until the oil industry turns around, the Houston job market isn’t going to rebound and support for home prices isn’t going to pick up either. And the picture for oil doesn’t look good: demand for refined products continues to lag expectations of where it should be based on the low price environment. The demand is looking a lot less elastic than most analysts assumed (including those within my company), and the competition between oil companies and oil states for market share is likely to hold prices down for quite a while. I’m not saying there aren’t opportunities, and it may still make sense to buy vs. rent if you live in Houston (since rents are still also inflated). But from a big picture perspective I would avoid investing in Houston real estate, at least for the next few years. Sam, not sure if you can see access my email address, but feel free to contact me to discuss. Thanks for the RealtyShares information Sam. We have been thinking about purchasing another investment property (we already have 10 units) but are dealing with some PITA issues right now too. (A third apartment going vacant next month…) This seems like the perfect thing to consider rather than adding more properties – to diversify more and still stay in real estate. One other really interesting point is #4 about your parents not wanting to move even to a “dream” home. I can totally see that with my parents and it makes me think hard about finding the “right” house before we get to that age where moving becomes too much to think about. I told him you just have to press the brake and push the button to start. He said, “Naaaaaaah.” Hard to change old habits! We like what we know. C’mon Sam, if you’re talking about buying a nice car, there’s a lot worse you could do than Porsche. Am I biased? Sure! Just look at my handle here. Two years ago, our suv was rear-ended. I had already considered a used one, but then the timing of the accident coincided with a nice 2-owner, excellent condition, low-miler S-model becoming available. It’s the absolute cheapest Porsche you can get. Marketwise, I have a hard time believing that it will depreciate outside of sustaining physical damage, especially with the recent change in engine (718). Say what you will, but the mid-engine is fun as hell to drive. It’s a manual. Maintenance isn’t exactly cheap, but they really are built to last. I can enjoy it probably forever. If I were into drag racing, maybe I’d get a ‘vette, but I much prefer the mountains and rivers. I generally would not advocate for investing in cars, but “lighting money on fire” is not your only option. Thanks for the info Sam, I need to sit down and do a comparison of all the crowd sourced real estate platforms while we build up enough money to drop into one. I was expecting you to be writing from Hawaii a few months a year! Good thing the beaches are all free and close by. Mahalo. I have done investments on Realtyshares, Realtymogul, Alphaflow and Realcrowd and have been pleased on all 4 sites although I will say my favorite is probably Alphaflow and Realtymogul. It’s great that you’ve had positive experiences with RE crowdfunding! Can you elaborate on why you prefer those two, specifically? For me, it would be interesting to know whether it’s a matter of ROI, user interface, transparency, vetting, diversity of investments, etc., or something else entirely. Mainly diversity of investments – I use Alphaflow to invest in their funds so you get the diversification across 75 different residential loans versus focusing on the one offs. For Realtymogul, I like their commercial and office offerings although not happy with their hotel deals that I am in. An important distinction between the cap rate in Honolulu, and the cap rates in the south and midwest is that you are not just comparing two different locations, and price points, but also completely different strategies. Renting your parent’s property in Honolulu represents traditional buy and hold, where your profit is driven by aquisition cost, rental income, and operational costs. When investing in residential property through RealtyShares you are not investing in buy and hold, you are investing in either fix and flip, or development. The distinction here is important as you’d want to consider different factors depending on the approach. With Buy and hold you want to look at rent:price ratios, property tax rates, HOA fees, etc. These are largely predictable, and easily researched. If the borrower has history of profitability as a manager of their property this is a relatively predictable invesment. With fix and flip or development, you are much more interested in the appreciation in that market, as well as the borrowers track record, which could vary wildly from person to person and is where the Realty Shares vetting process is hugely important. My 2 cents when analyzing the markets you mentioned is to look for areas with near term economic growth / strong appreciation to help hedge against the risk in trusting Realty Shares vetting process. A “rising tides raise all boats” type of approach. The type of thing I would be looking for is a big hiring event in smaller market. A large manufacturing facility, military base exapnsions, etc. A hiring event that is significant enough to create housing shortage pressure in that market and drive prices up. All that said, my buy and hold properties in Augusta, GA have done well the last 4 years, with yield in excess of 20%. I own and manage 7 of my own properties, and am closing on 2 through a partnership on August 12th, where my cash partner is providing 90% of the initial capital, and we share the profits 50/50. His projected yield in year 1 is 11.5%. You are correct. I’ve giving up buying a dream property for LIFESTYLE b/c my parents don’t want to move, and am now going to invest my cash for INCOME, the next best thing IMO. Only 5% of the Investments that first go through the vetting process end up available for investors (picture in the post). That gives me some confidence that I’m getting my money’s worth for the fees I will pay. RealtyShares need to offer good investments, or long term, they will not do well because investors will revolt and go somewhere else. Therefore, the interest is aligned. I don’t know anything about Texas or Georgia property, just that the cap rates are so much better than in Manhattan, Santa Monica, San Francisco, and Honolulu. Given I don’t have to live in TX or GA, not that they are bad places, my investment dollars are location agnostic. I just want to choose the best properties possible for the highest return. I’m clearly heavily overweight the SF Bay Area along w/ my Tahoe Property. If the tech market crashes (thank goodness Google, FB, and Apple beat numbers), then I will be hit harder than other RE investors. I need to diversify out. I think everybody with coastal investment property should diversify inward and towards the South. A 20% yield in Augusta is AMAZING! Just give me a guaranteed 10%, and I will invest ALL my money. You would never get that here in SF. But, you may get a 65%+ capital appreciation in the past 5 years as a consolation. Any downsides to your physical properties in GA? Where are you based? Hi Sam, may I ask why you say inwards and towards the South. I have a friend who lives in the Bay Area and he is currently looking at some commercial property (his first such investment) in the Seattle area. His realtor was showing him properties in Texas, but his reluctance with the South is the drought situation. I’m just curious if you have a particular reason to not go North? Hola Mitch, I feel everything is relative to where one is. North for me is Seattle and Portland, two great, booming cities. Could be good! But since I’m already heavy in SF, investing in Seattle and Portland is perhaps more of the same. They are benefiting from Bay Area relocators and strength in Amazon, Microsoft, etc. I shoulda invested there 5 years ago! For better diversification, I’m therefore looking inland and South where the dynamics (price, yield, economies) are very different from SF. I’m too levered into this economy. Gotta find new opportunities! I am physically located in Augusta, having relocated from the bay area to the south twice now. First after college at Cal to Wilmington, NC then again from Mountain View to Augusta after working in San Jose for 2 years. 2) scalability. properties here are cheap, with mine ranging from 85-125k in value. That’s a good thing in that there is low barrier to entry and strong cash flow. For example the last property I bought in may required ~25k investment, and cash flows ~500/month. The downside is that scaling to something larger is more challenging. Cash flowing 100k/yr here will require 15-20 properties, which means managing 15-20 tenants. When structuring the agreement with my partner on the two we’re buying now I presented the option of him putting up 100% of initial capital in exchange for a guaranteed 6% preferred return, but he preferred me having skin in the game through a 10% capital contribution and was willing to waive the preferred return. If a partner was willing to do 100% of initial capital, I’d do guaranteed preferred returns all day, with the rate being largely based on the volume that partner was willing to do. Higher volume of properties means greater dispersal of risk from any one property. Do you like living there better than the Bay Area? Very curious as I’ve lived in Virginia for 8 years before and have visited more Southern states and not sure I’d be happy there. After all, I’m totally biased after writing: West Coast Living – Yes It Really Is That Much Better! I have to say, I would prefer owning one property that is generating $100K/yr in rent versus 15-20 properties, even though my capital outlay was bigger ($330K down payment). It just is too much of a PITA to manage so many properties. 15-20 properties means 15-20 to 30-40 bathrooms that could break, 15-20 main electrical panels, etc. I couldn’t do it, unless it is totally hands off like a REIT or real estate crowdsourcing. Have you not gone through some tremendous tenant pain yet? If I were in your financial situation I never would have left the bay area. When I left I was making ~75k / yr, and very frustrated by my inability to meet my financial goals nor live in comfortable level of housing. When I relocated I viewed it as a sacrifice I was willing to make to achieve my career and financial goals. Having now lived here 4 years, I wouldn’t go back. Between my job and passive income, I should surpass 300k/ yr within the next 6 months, I’m able to live in a house nice enough to be a forever home with a 1,400/month mortgage, do things like surprise my dad with a Mazda mita (his dream car) as a retirement gift, etc. Life is also simpler not wrestling with traffic nor parking. Proximity to Atlanta makes travel easy, and both the beach and mountains are within a 3 hour drive. I live a much much better lifestyle here. I’ve had two major issues with $4k+ of damages, which is significant given that’s 5% of property value. Most recently I evicted tenants earlier this year that were breeding and selling pit Bulls out of the property. I got them moved out, repairs made, and new tenants in within 6 days. They were military, so a quick call and text of pictures to their commanding officer and I was reimbursed within a week. All told maybe 3 hours of work. Some might view all the issues as tremendous pain, but I view 3 hours of work as a walk in the park for over 6k in annual yield. The numbers will become a pain as we grow, but given the low cost of living here, hiring an assistant for $15/hr would go a long way. I have been evaluating the Crowd Funded Real Estate platforms as well, my concern has been that many of these companies are self auditing their financials and don’t have outside accounting firm(s) reviewing their financials. Do you know how RealtyShare handles this? My other big concern is more taxable income, are you setting up this account in a taxable account or Self Directed IRA? I wouldn’t mind having a taxable account but wasn’t sure how the gains are taxed, if you continually reinvest are you not taxed, etc. We our a privately held company so we do self audit. We are following GAAP for our account practices and the SEC requires a number of years of GAAP accounting records if a company ever wants to go public so we are following those guidelines. Investors can invest in taxable accounts or a Self-Directed IRA. Even privately held businesses can get an independent audit of their financial statements. A company planning to go public will need to have an audit at least a couple years before because IPOs have a lot of legal liability for the CPA so they will not want to issue an opinion on IPO financial statements for a brand new client. Good questions. Let me ask them to respond. Stay tuned. I’m actually checking w/ my custodian of my Rollover IRA right now to see if I can invest my cash there into real estate crowdsourcing platforms. If so, I will be much more aggressive. Minus of investing out of IRA is that you can’t easily deduct losses. I invest directly in similar properties through an investment group. Have to wait a long time between investments though. Commitments are larger, but there is more visibility and control. Hard to judge performance of RS until we go through another financial crisis or lengthy recession. You remind me I have to publish my 2016-2017 annual passive income report. Yes, I’m definitely happy to get the bonus, and I will match it to put skin in the game. I really need to find a comfortable way to deploy capital for income w/ my upcoming CD and final severance payment. I’m only going to include the income from my RealtyShares investments as part of my passive income report. In the past, I would just go ALL IN too soon and just dump like $50,000 or $100,000 without being thoroughly thorough. Now, I’m much more methodical as there’s no such thing as a risk-free investment except for cash, CDs, and US Treasuries!